So I discovered a Wolf-Rayet star! OK, I should admit right from the start that while I feel as though I have “discovered” a Wolf-Rayet star, it turns out to be very well-known to science, so I don’t think there is any chance that I will be invited to give it a name, less yet have it named after me! In my experimenting with backyard spectroscopy, I thought it would be interesting to capture a single spectral image with a group of several stars of comparable brightness but varying spectral classes, to illustrate the different spectral “signatures” side-by-side. Firstly, there are simply too many stars (some millions of them), so all of the spectra just smear together into one fuzzy streak. So what I needed was a small open cluster - small, because of the small capture area of my set-up (about 0.3 degrees wide x 0.24 degrees), and open, so that I might capture perhaps 10 comparably bright stars with their spectra, spread over the frame. A bit of a review of possible targets suggest NGC 6231 (a.k.a. Caldwell 76) as a good candidate - approximately 0.25 degrees across, and with a good spread of stars with Magnitude 6 to 7 approximately. As I was hoping, you can see a few different stellar “signatures” - some spectra are longer than others, some show some strong absorption lines, and so on - perfect, just what I was hoping for! But look at the spectrum of the bright star at the mid-height of the frame - it looks very different to the others. You can see that it has several intense bright emission lines - what could this mean? Yes, those bright points that I saw in the original image have come through as strong emission lines, at wavelengths of about 4650, 5690, 5810, 6560 and 6730 Angstroms. So - mystery solved - Open Cluster NGC 6231 (C 76) contains a Wolf-Rayet star, with Spectral Class WC! Sure enough, my “discovery” turns out to be the well-documented HD 152270 (a.k.a. HR 6265). Oh well - I guess my first real discovery will have to wait for another day! Nevertheless, I hope this little story expresses some of the genuine thrill that can be found in doing “real science” in your backyard! 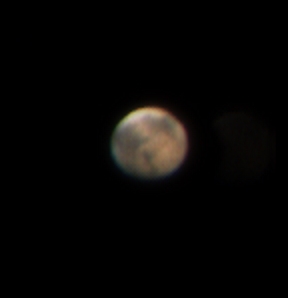 Detecting Methane in Neptune's Atmosphere - from my Backyard! I am capturing stellar spectra using a 200 mm Meade LX-90 telescope with 0.63 Focal Reducer (Effective Focal Ratio f/6.3), QHY5 mono camera, and a Star Analyser SA100 grating. 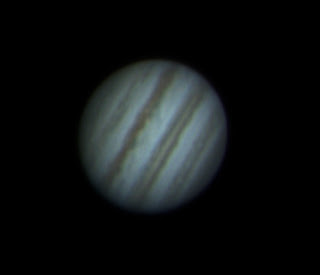 The camera is mounted on a “flip mirror” diagonal, which allows the telescope to be aligned visually with an eyepiece, and then the mirror is flipped out of the light path to the camera and grating. There are some conspicuous dark absorption bands in the spectrum of Neptune - let’s see if we can work out what we’re looking at. Note the “bell curve” shape of the spectrum plot - this is largely due to the varying sensitivity of the camera for different wavelengths. The camera is designed to capture visible light, with peak sensitivity in the green, diminishing sensitivity in the blue and red, very limited sensitivity in the Ultraviolet (< 4000 Å), and limited sensitivity in the Infrared (> 7500 Å). When we calibrate for the Instrument Response, we get the following graph, which better represents the ACTUAL relative intensity of the spectrum across the range of visible wavelengths. Neptune shines in reflected sunlight - and the Sun is a Class G2V star. When we overlay a classic G2V spectrum, we can see that the spectrum of Neptune broadly follows the same shape, but there are some conspicuous absorption bands which are not seen in the Sun’s spectrum - what could these be? Methane is commonly known for its absorption in the infrared (hence its significance as a Greenhouse Gas in the Earth’s atmosphere), but it also has a number of absorption / emission lines in the visible spectrum, at wavelengths of 4860, 5430, 5760, 5960, 6190 & 6680 Å. When we overlay these lines on the spectrum, we see an excellent correlation. Bingo! Neptune’s atmosphere is confirmed to contain a significant amount of Methane! This may not come as any news to experienced planetary scientists (I don't think NASA needs to launch a mission to confirm my “findings”! ), but I find it quite astonishing what can be accomplished by a very inexpert amateur with very modest equipment in their backyard! Yes, people really do 3D CAD on Mobile devices! I've been using OnShape https://www.onshape.com/ as my primary 3D modelling package for some time now - both for designing parts for my hobby 3D printing and laser cutting, and also for general work (engineering) applications. You can check out my early quick review here: http://julianh72.blogspot.com.au/2015/08/affordable-free-3d-modelling-software-5.html - and the more I've used it, the more impressed I've been. 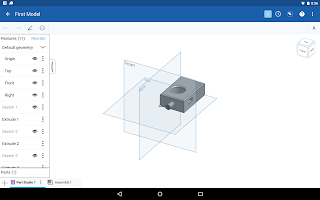 I use OnShape primarily via Chrome browser on a Windows laptop (work or home) or a Windows tablet or a Chromebook, but I also use it on my Android tablet (and it is also available for iPads). What surprises many people is that OnShape can truly be used for full-featured 3D modelling (not just viewing) on mobile devices. OnShape have just released a blog post "YES, PEOPLE REALLY DO CAD ON MOBILE!" 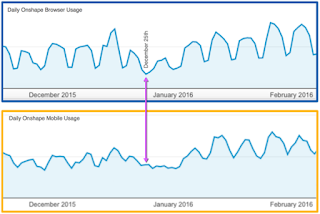 https://www.onshape.com/cad-blog/yes-people-users-really-do-cad-on-mobile?utm_source=hs_email&utm_medium=email&utm_content=29936753&_hsenc=p2ANqtz-_jJNrK2qf9-xSiJlTvoqBOoscIhi_lDT2Vjq5p3JUpel2rp7KPKmYUU2SwkCkRlqVDaBJJ5WUiwAwE5vgIpQKm9UIODA&_hsmi=29936753 which gives some actual statistics which demonstrate that people really are using OnShape Mobile for modelling and design, not just viewing. 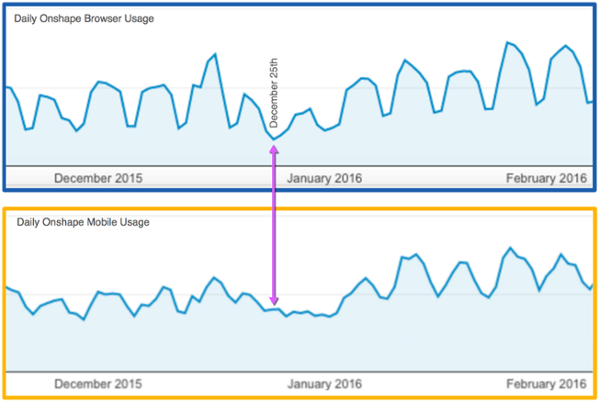 While browser use is an order of magnitude bigger than mobile use (as you would expect), it is interesting to note that the usage patterns mimic each other on both platforms, except on weekends and holiday periods, where mobile use sees proportionately less of a dip than browser use - indicating it is the "platform of choice" for many users when you are away from the office. If you are looking for a capable low-cost (free!) 3D modelling package for your hobby use, you really need to check out OnShape, if you have not done so already! 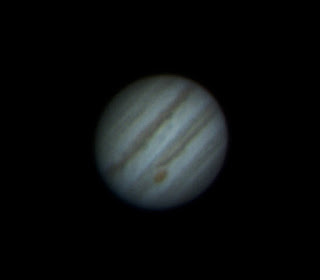 While seeing wasn't great from my home in inner-western Brisbane last night (13 April), it was nice and dark and clear, so I set up my Meade 200 mm LX90 (GoTo Alt-Az mount) with ZWO ASI120MC (one-shot colour camera) http://julianh72.blogspot.com.au/2014/09/zwo-asi120mc-planetary-camera-quick.html, and fired off a few 30-second video captures with FireCapture, and then stacked and sharpened in AutoStakkert to get the best images that I could. 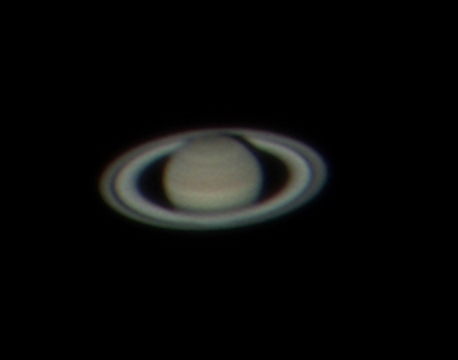 Mars and Saturn were fairly low in the sky, sitting in the sky-glow of Brisbane City to the east (and directly over my roof), so while I'm fairly happy with these shots, I hope to get some better images in a couple of months when they're a bit higher as well. My best videos were taken without a Barlow - I just couldn't seem to get quite as sharp focus with my 2x Barlow. Maybe I need to try focussing with a Bahtinov mask on a nearby star before pointing at my target? These are the best of last night's efforts - they may not rival Hubble, but I'm pretty happy with them. Use your phone / tablet as a 3D printer?! 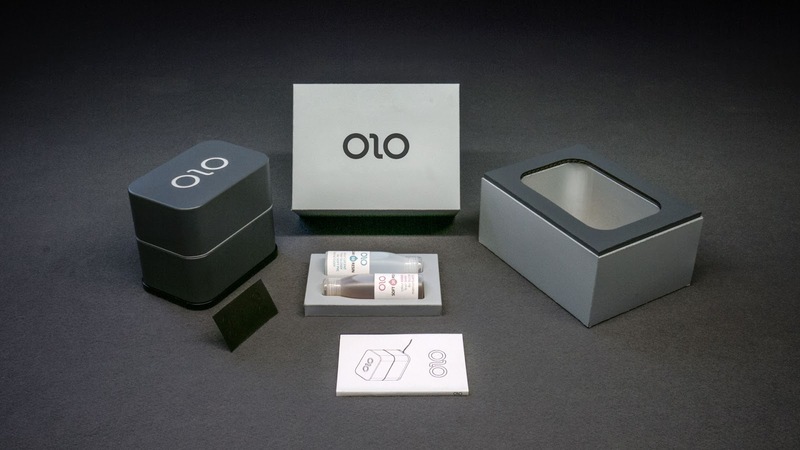 This 3D Printer concept uses your smartphone or tablet as the light source to cure photo-resins. Virtually silent, runs off 4 x AA batteries. 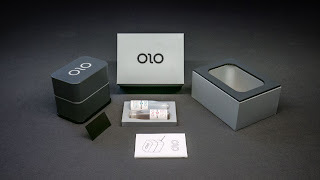 It's only $99 for the printer (build volume: 76 mm x 128 mm x 52 mm; vertical build rate of about 10 mm/hour or so), and $15 for a 100 mL bottle of resin (a range of hard and flexible resins available); prints with virtually no waste. It sounds too good to be true - I'll believe this is a real thing when I see one actually working. 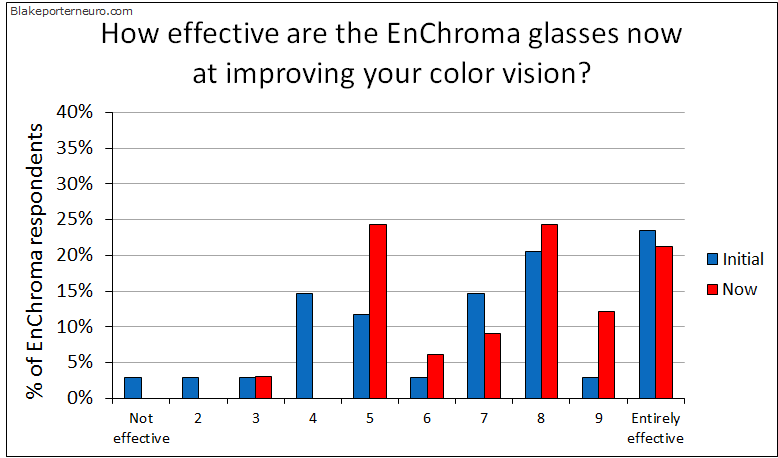 Survey results: "Color Vision and the Efficacy of EnChroma Glasses"
Blake Porter has published the results of his on-line survey http://www.blakeporterneuro.com/color-vision-efficacy-enchroma-glasses/ into the efficacy of EnChroma sunglasses as an aid for compensating for colour blindness. He previously published a fantastic piece entitled "What is color? 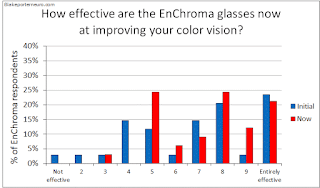 Enchroma glasses, neuroscience, and the mystery of color" http://www.blakeporterneuro.com/enchroma-neuroscience-color/, which I mentioned in an earlier post http://julianh72.blogspot.com.au/2015/09/fantastic-article-on-enchroma-glasses.html - do take a look at this article, if you have not already done so - it is a fascinating read and very thought-provoking. A total of 406 people responded to the survey, so it is a useful sample size. A significant majority of respondents were males in their twenties, which is not really surprising - males are more commonly affected by colour blindness than females, and the poll was conducted as an on-line survey, so some internet-savvy was required to even be aware of the poll, and then to complete it. And the results of the survey? In a nutshell - they really do work, for the majority of users. What we may conclude with some certainty is that people who have a language full of color words, are color blind, and then use corrective means to aid their color blindness, new conscious color perceptions are near instantaneous, possibly due to the broad processing capacity of the visual system, and there seems to be an intuition present, possibly due to knowledge from language, allowing these people to correctly assign their new colors with language. Overtime, their processing of new colors and their ability to discriminate across colors will be improved and the time course of this may be age dependent.